"Oh, hai Shark," is a giant missed opportunity in the Big Shark trailer. However, that is not to say that the first look at the horror movie from the creators of The Room is bad. It looks pretty incredible and we can't wait to see some more in the coming months. 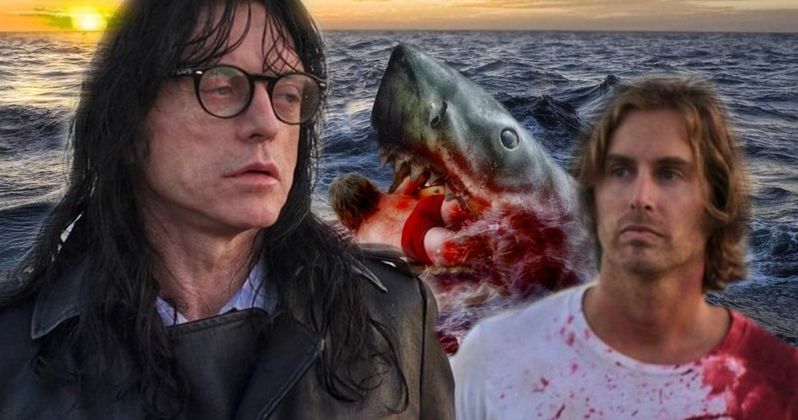 Seemingly out of nowhere, Tommy Wiseau revealed that he was working on the project about a giant killer shark and people are pretty excited to see what he comes up with this time. The Big Shark trailer starts innocently enough with Tommy Wiseau's Room co-star Greg Sestero getting slapped in the face by two different women. It's unclear what he did to deserve this reaction, but it comes out of nowhere and it's rather uncomfortable, like the best parts of The Room. Soon after, we see Tommy Wiseau, Sestero, and Isaiah LaBorde leaving the bar/club atmosphere to go somewhere else. It's now that we see the streets fill up with water and a giant shark attacks a woman behind the three men. The bad CGI shark is definitely one of the more humorous things to hit the internet in some time. It literally looks like a shark that was designed by Tommy Wiseau or a five-year old after being given an iPad Pro and five minutes to create the epic vision. Big Shark is still a mystery at this point in time and it's believed that the movie hasn't even started filming yet. The trailer was more than likely released to spread the word and potentially find someone to financially back the project. Greg Sestero says that Big Shark is about three firefighters trying to save the world, which makes sense. While the movie has yet to be filmed, it is believed that it is gearing up for release in September of this year. No official release date has been announced, but we're going to be keeping an eye out for it based on the strength of the first trailer. There will definitely be comparisons to the Sharknado franchise and possibly even The Meg when all is said and done, but this is Tommy Wiseau that we're talking about here, the only man who would release a movie called Big Shark a month after Shark Week. You can watch the trailer for Big Shark below, thanks to Tommy Wiseau's YouTube channel.